A couple of late Beauden Barrett penalties has helped the Hurricanes repel a valiant Bulls fight back and secure a hard-fought 25-20 Super Rugby win in Napier. Despite having to overcome jet lag, seeing several players go off with injury and having to do plenty of early tackling, the Bulls outscored the home side two tries to one on Saturday night. 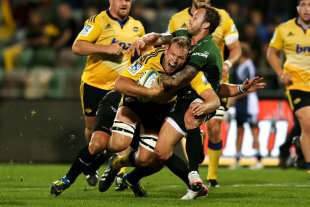 They trailed until the final quarter hour, when the Hurricanes managed to disrupt their much-vaunted rolling maul. But as the maul broke up, the Bulls got the ball out to replacement five-eighth Handre Pollard, who sliced through a gap to touch down. Pollard landed the conversion to put the Bulls ahead 20-19. However, Barrett nudged the Hurricanes back in front via a penalty with eight minutes to go and then added another after the hooter to end with a 20-point haul. For the Hurricanes, winger Julian Savea produced some blockbusting runs, while fullback Andre Taylor showed glimpses of his excellent form of two seasons ago. Their scrum was strong and they were also able to neutralise the Bulls' attempts at driving mauls from the lineout. The Hurricanes dominated the first half as they kept ball in hand to try to wear down the opposition. But they turned around only 16-13 up as the Bulls responded to being asked to make a huge number of tackles with a determined defensive effort. A well-worked try helped the Hurricanes out a 10-0 lead after a period camped in Bulls territory. From a five-metre scrum, Barrett's well-weighted cross-field kick was passed back by winger Cory Jane for Taylor to dot down. Barrett and opposition No.10 Jacques-Louis Potgieter traded penalties before the Bulls scored a try from nowhere. Potgieter put up a big bomb, which he regathered before sending fullback Jurgen Visser away to the tryline. The conversion made for a score-line that was out of character given where most of the first half had been played. The Bulls appeared refreshed by the break and made a better start to the second period. But Barrett pushed the Hurricanes further ahead midway through the spell with another penalty, before Pollard's converted try had the Bulls sniffing victory.